Single-family home sales declined across the Austin-Round Rock Metropolitan Statistical Area (MSA) and increased in the city of Austin in March, according to the March 2017 Central Texas Housing Market Report released today by the Austin Board of REALTORS. Analyzing a growing disparity in market conditions among housing price classes, the report underscored the need for policies that create additional housing capacity to meet the market demand and a broader range of housing types throughout the region. In March 2017, single-family home sales in the Austin-Round Rock MSA declined 1.4 percent year-over-year to 2,509 home sales. During the same time frame, median price for single-family homes increased 5.6 percent to $295,767, and housing inventory increased 0.2 months to 2.4 months of inventory. Within the city of Austin, single-family home sales increased 1.2 percent year-over-year to 780 home sales in March 2017. The median price for single-family homes jumped 12.6 percent from March 2016 to $371,606, and housing inventory increased 0.1 months to 1.8 months of inventory. An analysis of March 2017 housing market data by price class revealed disparities in sales activity, time spent on the market and inventory of single-family homes throughout the region. Price class breakdowns of single-family home sales revealed annual declines in the sales volume and availability of lower-priced homes and corresponding gains in the sales volume and inventory of higher-priced homes. In the city of Austin, sales volume among single-family homes priced less than $300,000 fell sharply in March 2017, while the volume of homes sold for $300,000 and higher increased significantly during the same time frame (see chart). The monthly housing inventory for single-family homes priced $250,000 or less in the city of Austin was less than half a month in March 2017, or essentially nonexistent. Single-family homes priced between $150,000 and $250,000 spent less than one month on the market in March 2017. 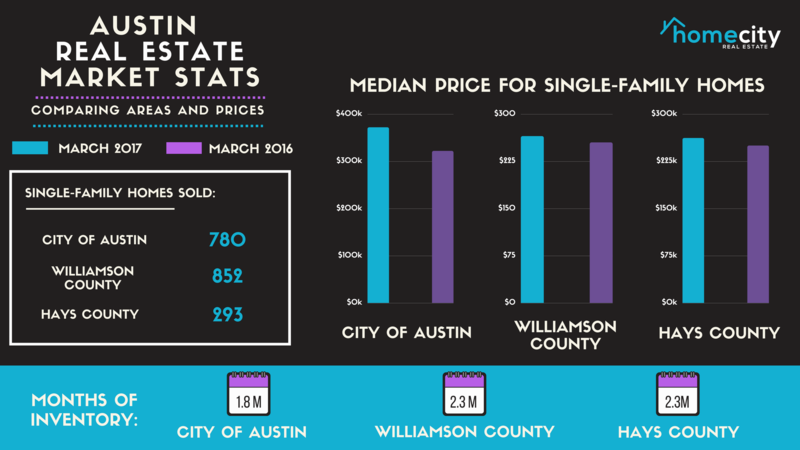 During the same time frame, Austin single-family homes priced $500,000 and higher spent more than 60 days on the market and posted significantly higher inventory levels. For more information on the March 2017 Central Texas Housing Market Report, go to ABoR.com/statsmar17.